PROVIDENCE, R.I. – There’s been a dramatic sea change taking place in higher education within the Ocean State. Just take a look at Rhode Island College (RIC). The 164-year-old public institution that stretches across a sprawling 180 acres of land has been making some audacious moves in recent years, thanks to the visionary leadership of its president, Dr. Frank D. Sánchez. “He’s the real deal,” declares Dr. Jason L. Meriwether, vice president for student success at RIC. A seasoned administrator who has held leadership positions in student a­ffairs at Indiana University Southeast and Fisk University, Meriwether credits Sánchez with making diversity, inclusion and student engagement a cornerstone of his presidential agenda. There’s no question that Sánchez — a native of Cheyenne, Wyoming — has become one of the loudest cheerleaders for public education throughout this tiny New England state. His mantra to elected officials is both pointed and quite simple: Investing in a Rhode Island College student is an investment in the state. ­The dividends, he argues, will inevitably pay off for many decades to come. That kind of talk has positioned Sánchez as a thought leader throughout the state, as he and his leadership team experiment with new ways to “reintroduce” RIC to locals as an affordable and viable option for obtaining a college education. Such a rebranding e­ffort requires a history lesson about RIC’s early beginning as a place that was founded to provide an education to the state’s burgeoning immigrant populations and its blue-collar families. Today, the college boasts a student population of about 8,300. About 1,000 of them are graduate students. About 87 percent hail from Rhode Island and 47 percent of this year’s entering class are the first in their family to pursue a college degree. Fifty percent are Pell eligible and an additional 44 percent classify themselves as racially and ethnically diverse. 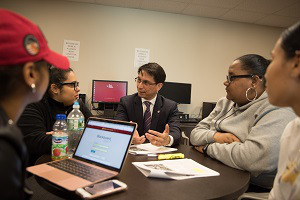 That student profile is what caused Sánchez — who served for five years as the vice chancellor for student affairs at the City University of New York (CUNY) system — to give RIC a closer look. 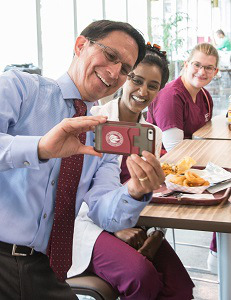 “If I’m honest, I wouldn’t have imagined Rhode Island College would’ve been a place that I’d gone to,” says Sánchez, whose previous job meant that he worked with 24 vice presidents of student affairs at 11 four-year institutions, seven community colleges, and six graduate and professional schools, on a wide range of policy programs, special initiatives and public and private partnerships to leverage resources across New York City. More than one-half million students are enrolled in the CUNY system. Destin Kowrati Bibemi, a senior majoring in marketing at RIC, says that he has been impressed with how visible Sánchez has been on campus. Bibemi points to the creation of The Unity Center and the hiring of Anna Cano Morales — an RIC alumna — as the associate vice president of Community, Equity and Diversity as an indication that the college has made diversity and inclusion a top priority. This month, the college will feature a panel discussion with Judy Shepard, the mother of Matthew Shepard, a University of Wyoming student who was beaten, tortured and left for dead twenty years ago because he was gay. Twenty years ago, Sánchez was associate director of housing at the University of Wyoming and was part of the crisis team that responded to the unfortunate incident. Since arriving at RIC, he has made inclusive excellence one of the five pillars embedded in the college’s strategic plan along with learning innovation, student success, community partnerships and institutional effectiveness. Sánchez says that each vice president is responsible for putting together a diversity plan for their particular unit, and he is actively working to improve the number of minority faculty and staff at the institution. “There has to be accountability,” says Sánchez, adding that his executive team has become less vertical and hierarchical and more horizontal. “My assumption is that each of you can do the job,” he often tells members of his cabinet. That type of leadership has won him high praise from those who work for him. Indeed, the college is undergoing both a physical and spiritual metamorphosis. Old buildings have been gutted to make room for innovative classrooms, and the morale among students, staff and faculty — following some turbulent times in the college’s recent history that witnessed the resignation of its former president — has dramatically improved. Earlier this summer, Rhode Island Governor Gina Raimondo appointed Sánchez to a two-year term as delegate to the New England Board of Higher Education, an agency that actively works to push educational opportunities and services to residents living in six New England states. Having spent the past 27 years in higher education, working at large, small, urban, rural, public and private institutions, Sánchez has become a staunch advocate for college access — particularly for low-income and first-generation college students. He says that programs like Upward Bound — which actress Viola Davis and her sisters participated in at Rhode Island College during their youth — are essential to helping individuals succeed. As the youngest of four children, Sánchez learned the importance of education from his parents. His mother, a migrant child who was born in Mexico, had a third-grade education when she arrived to this country, but eventually was able to earn an associate’s degree. His father — a high school dropout — joined the Marines and received his GED, enrolling at a community college and then earning a bachelor’s degree and two master’s degrees. He would later become a principal at an alternative high school. There was no question that the Sánchez children — three of whom would eventually earn advanced degrees — would go on to college. Paying it forward has been a central part of Sánchez’s work, as he mentors up-and-coming scholar practitioners like Constanza Cabello, assistant to the president for Institutional Diversity and director of Intercultural Affairs at Stonehill College in nearby Massachusetts. “Dr. Frank Sánchez is a true champion of change, innovation and success within higher education,” says Cabello, who is also a doctoral student at Northeastern University. Cabello says that she’s impressed by Sánchez’s commitment to advancing higher education through his volunteerism work with professional associations. This article appeared in the October 4, 2018 edition of Diverse. ← Yes, the Queen Knows How to Drive – but There’s a Catch!